This Saturday at 1:00 PM EST, Tony Casas and yours truly will be guests on Episode 55 of Stogie 411. Stogie 411 is hosted by Mike Williams of mikesstogies.com and Mike Forry of stogiereview.com. Make sure to check out the show live at stogie411.com. Also, if we bore you, you can browse the site and check out the excellent interviews they have with manufactures, brand owners, and other individuals throughout the cigar industry. 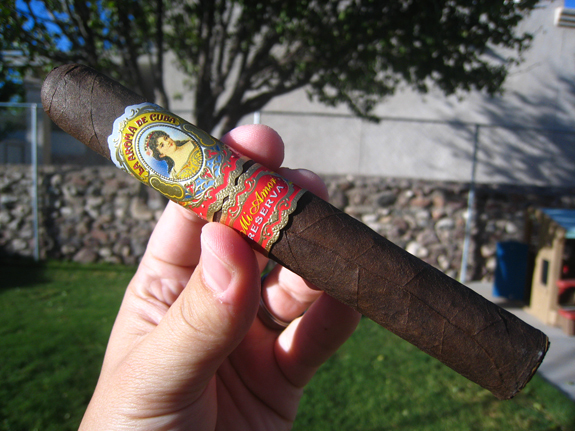 This week, I bring to you the La Aroma De Cuba Mi Amor Reserva, which was released at the 2012 IPCPR annual trade show. It is sad to say, but I have yet to smoke the regular Mi Amor cigar or any Ashton product for that matter. The Mi Amor Reserva is produced at the My Father Factory in Esteli, Nicaragua. 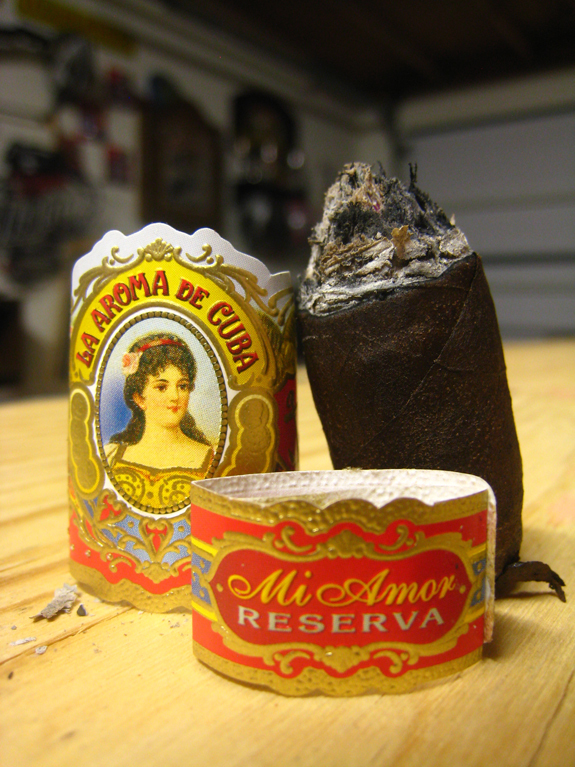 According to a Halfwheel.com news article, the Mi Amor Reserva “features a Mexican oscuro wrapper, as opposed to the San Andrés maduro on the regular Mi Amor”. The La Aroma De Cuba Mi Amor Reserva is available in four vitolas: Beso (5 ⅝ by 48), Maximo (5 ½ by 54), Divino (6 ¼ by 52), and Romantico (6 ⅞ by 50). The Mi Amor Reserva wears a dark chocolate wrapper that looks great against the colors of the ornate bands. Small veins crisscross down the Mexican Oscuro wrapper that is somewhat toothy. The box pressed cigar is evenly and firmly packed. A beautiful cedar aroma comes right off of the wrapper followed by some barnyard and chocolate. 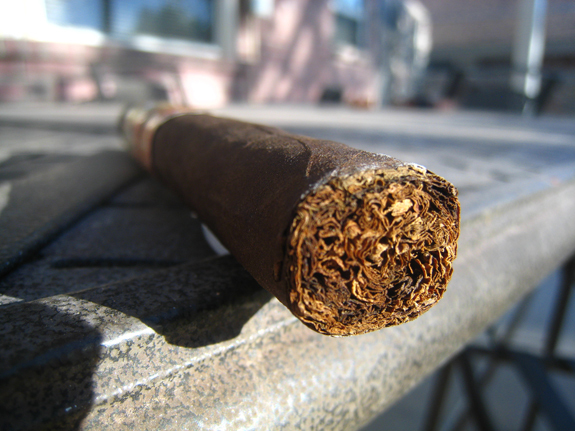 The foot of the cigar is much more rich, with some different spices and cedar. 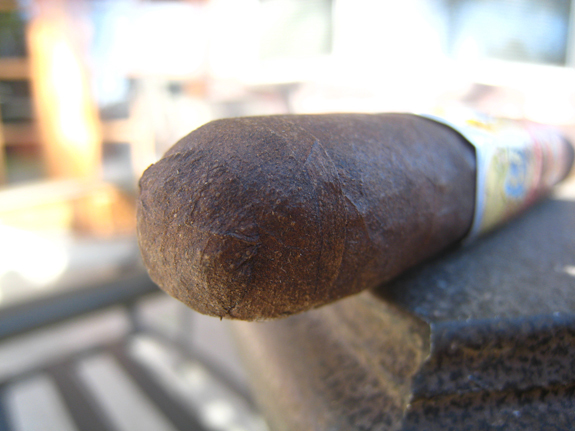 The cap rounds out the cigar nicely, and what appears to be a triple cap has been applied neatly. The initial clip with my Xikar Xi cutter revealed a firm draw, but cutting a little deeper I am now presented with a workable draw with just a small amount of resistance. The tobacco is packed extremely tight under the cap. Instantly, chocolate, clove, and cinnamon hit my palate on the cold draw. The cold draw is very rich, similar to the foot aroma. A sweetness hits the front of my palate and spice, cocoa, and earth notes come forth as the smoke moves to the back of my mouth. The spice leaves a minor tingle in the back of my throat. The sweetness really lingers on the finish of the smoke, along with some cocoa. The retrohale is surprisingly smooth, which I was not expecting due to the intensity of the flavors. The flavors are balanced and full. The burn got off to a wavy start but I’m going to wait to see if it will correct itself on its own before pulling out my lighter. Just an inch in and the burn has almost completely self-corrected. The white ash is on the flaky side but held to over an inch. . I am still enjoying the sweetness I get on each puff. For those of you that do not know this, I am huge coffee drinker, which may be tied to my Finnish heritage. This cigar is like drinking a perfectly brewed cup of black, Costa Rican, maybe Brazilian, coffee that offers complexity and a sweetness that balances out the profile. The smoke is very cool leaving no bite on the tongue. Flavors remain balanced and extremely refreshing. My palate is ready for each puff. The retrohale has moved up a notch as pepper is now leaving quite a sting in my sinuses. That will wake you up. The now layered ash continues to hold strong past an inch. The burn line is a little edgy but not of any concern. At the end of the second third, I am beginning to feel a little nicotine kick. As I enter the final third about an hour and fifteen minutes in, the cocoa and earth notes are playing a more significant role in the profile. The earthiness is somewhat dirt-like but not at all in a bad way. The spice has also stepped up, warming my entire palate. The finish has become a dusty cocoa, leaving my palate a tad dry, which is quickly fixed with a sip of water. The richness of the smoke is in full force in the final third. The smoke is just bellowing out of this La Aroma De Cuba Mi Amor Reserva. With an 1 ½ inch remaining, the cedar has come back around. This has to be one of the most enjoyable cedar flavors I have picked up on in a cigar. 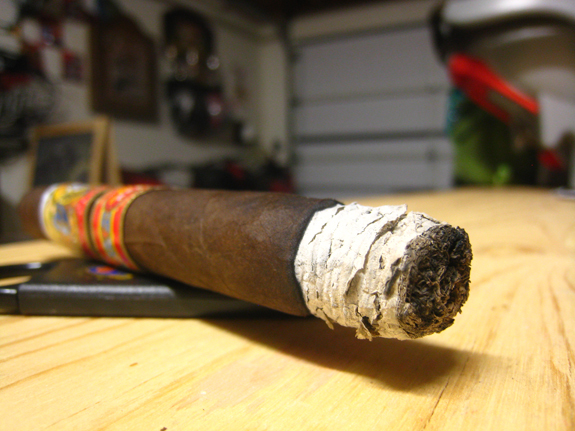 While the flavors remained full the entire stick, the strength crept up through each third. At the close of the Reserva, the strength is medium/full. 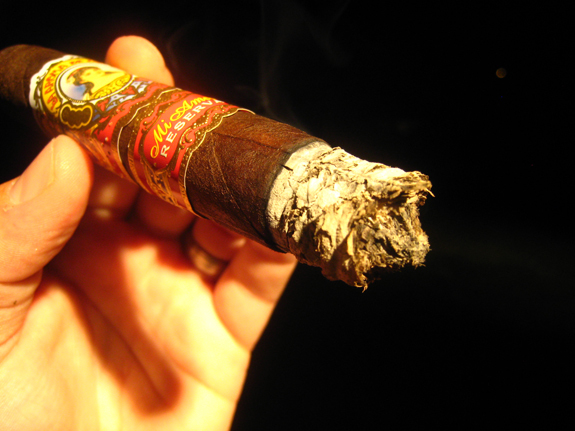 If you could not tell from the review, I really, really enjoyed the La Aroma De Cuba Mi Amor Reserva. While the flavors were common, it was the balance and the shifts in flavors that made this a journey I would love to take again. The burn line started off a little iffy but quickly fixed itself. There is not much more to say other than stay on the lookout for the Mi Amor Reserva. 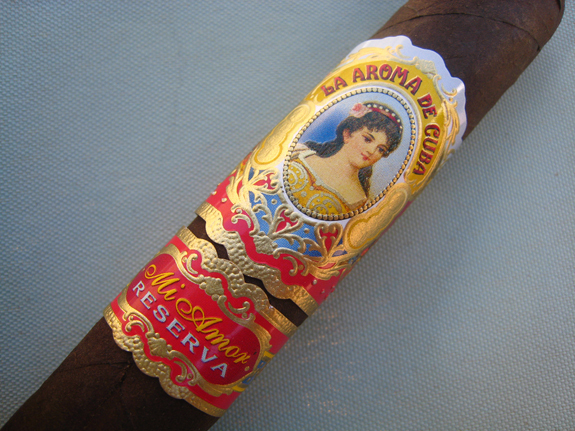 Our site sponsor, smokeinn.com, has all the sizes available and a five pack of the La Aroma De Cuba Mi Amor Reserva Divino will run you $48.75. I believe they are well worth the price. After enjoying the Reserva so much, I will definitely be trying out the regular Mi Amor. I’ll try to do full review on the regular line, thanks for the idea! I’m pretty sure a local shop has them in stock. Just another excuse to go check! The Mi Amor is great, so I really need to pick up on one of these. Yeah, I think Daniel is a little camera shy. Don’t know why. He is easily the best looking guy out of the three of us. The show should be a blast, but I have no clue what we are going to do for an hour other than goof off. Thanks for checking out the review! Nice job on “411” You guys did good! Great stick and go to favorite. Well worth the effort but a bit pricey. 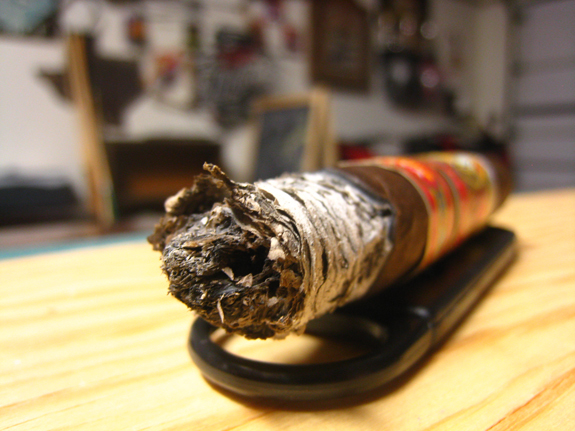 The Mi Amor Duque another great stick and comes in a bit easier on the wallet. Reserva and Mi Amor flat out the best. Thanks for checking out the review. I will definitely need to check out the Duque. It is time I revisit the Mi Amors. It has been a long time.